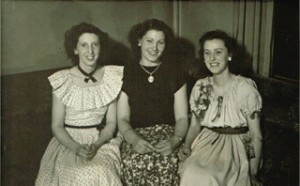 Your own family members are your most precious resource, so if you can, ask them as much as possible. 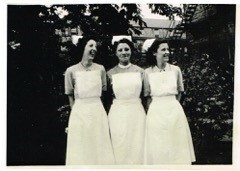 Our Recollections book is designed to help in this process. You are probably going to amass a large volume of detail. Before you begin, think how you are going to record what you find. In a database, online, by hand, or in a format of your own devising? All of these options are valid, but make sure that they will last, and that they will be understood not only by yourself but by anyone else you might want to share them with. Be meticulous. Every time you record a fact, or a theory, make a note of where you found it. To avoid having to revisit records, make sure that you capture everything the record says, the first time, by saving an image or transcribing it in full, with its source. Using full names and dates if possible: not just ‘Mum and Dad’! Find out about places and occupations; as well as making the research more interesting, it might explain where an ancestor might have come from or where they worshipped. … unless they are supported at each stage with clear evidence, such as an image, citation or link to a primary historical record. It may not always be possible to establish clear-cut evidence of a link, particularly in a period or location where records are sparse, but avoid gung-ho or wishful thinking genealogy. To err is human. Transcriptions and indexes are never completely accurate. Early genealogical works such as Burke’s Landed Gentry relied on family information that was often wildly inaccurate. If you hit a problem: be logical. Don’t be tempted to just search what is online, on the shelf in front of you, or indexed. The answer may be quietly sitting in an unindexed record from the parish next door. the village is remarkably cheerful and pleasant, and contains several respectable houses. Large towns and significant parishes are given much more space: the entry for Carlisle, for example, runs to three and a half pages. to procure, by personal examination and enquiry, the fullest information upon the various subjects contemplated in the plan of the work. He had originally conceived the dictionary as purely topographical, but then decided to include historical information, and so ‘other gentlemen’ were employed to sift out ‘notices of the most important occurrences connected with each spot’. Nineteenth century data collection was a cumbersome business. 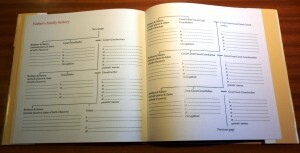 The project began in 1825 and the initial survey, using a printed questionnaire, took place over three years. The raw material also included some 3,000 documents donated by ‘a clergyman residing in the neighbourhood of Ashby de la Zouch’ who had attempted a similar project by sending questionnaires to every parish priest in the kingdom. Not all had complied; not all the questionnaires had been fully completed, and it may be imagined that the unnamed clergyman relinquished his mountain of paperwork with some relief to the publishers. Scholars from the British Museum, the London Institution and elsewhere provided additional information. Members of the local nobility and gentry also contributed, some donating material that had not previously been published. The maps were engraved on steel plates from drawings made ‘from the best authorities’. In the copies circulating today, these maps have too often been plucked from the books and resold. 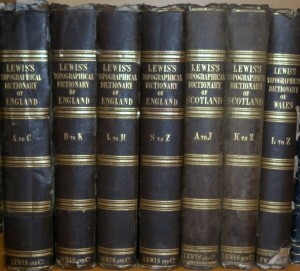 The work of compilation and editing took a further three years and Lewis estimated the entire cost of producing the first edition at nearly £48,000. Inevitably, the work attracted plagiarists, and Lewis successfully took Archibald Fullarton to the Court of Chancery in 1839 for his New and Comprehensive Gazetteer of England and Wales, which was published in Glasgow hard on the heels of Lewis’s work, and which was judged by the court to be ‘to a very considerable extent a piracy of the plaintiff’s copyright’. In the early stages of the project Lewis had a business partner, George Pringle, who was still involved in 1836 when Pringle and Lewis were named as principal creditors of a bankrupt printer of Andover, Benjamin Bensley. By 1846, Pringle was referred to as his ‘late partner’. His only son, Samuel Lewis the younger (1821–1862), joined in the enterprise as a draughtsman, and also published two works on the history and topography of Islington, but died, of pneumonia, at the age of only 42. 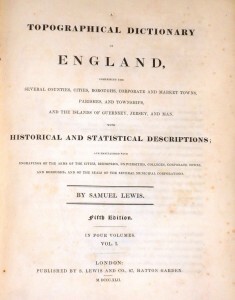 In response to the early editions, Lewis received thousands of letters with corrections and additions with which he revised the text, and so the later editions are more reliable. By 1849 there had been seven editions, and similar volumes for Scotland, Wales and Ireland had also been published. Presumably in gratitude to the many clergymen who supported and contributed the work, in 1848 Lewis donated 100 guineas to the Society for the Sons of the Clergy of the Church of Scotland. ‘Gentlemen should not put down their names to such a work unless they intended to pay’. Samuel Lewis married, on 18 November 1816 at St George the Martyr, Southwark, Charlotte, the daughter of Thomas and Ann Tuchin, who had moved from Warwickshire to London. Samuel’s own parentage has not yet been established but he appears to have been baptised in an Independent Chapel in Abingdon, Berkshire, on 2 June 1782: Abingdon was certainly his place of birth. His son Samuel was born in Worcester and baptised there on 29 April 1821 (at St Martin’s); he was followed by a daughter Jane, baptised at St James, Clerkenwell, Middlesex, on 22 January 1826; and by Eliza, baptised on 20 February 1828 at St Stephen, Colman Street, London. Eliza never married and lived at home until her father’s death. Lewis & Co had business premises at 87 Aldersgate Street (1831); at 87 Hatton Garden (1842); and at 13 Finsbury Place South (1845). Samuel lived with his family in Myddleton Street, Clerkenwell, in 1826 and at 13 Coleman Street, London, in 1828, but by 1841 he had settled in Islington, where he died, at 19 Compton Terrace, on 28 February 1865. His estate was valued at under £7,000. 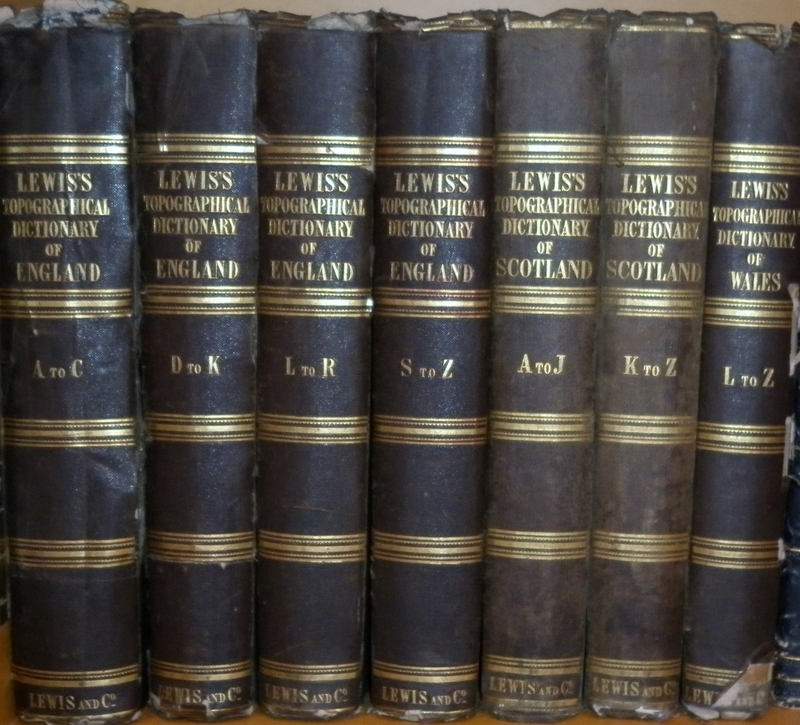 In the census return of 1861 he was described not as a publisher but as a landed proprietor and fund holder; whatever his origins, Lewis at the end of his life had established himself as one of the English gentlemen for whom his great work was created. 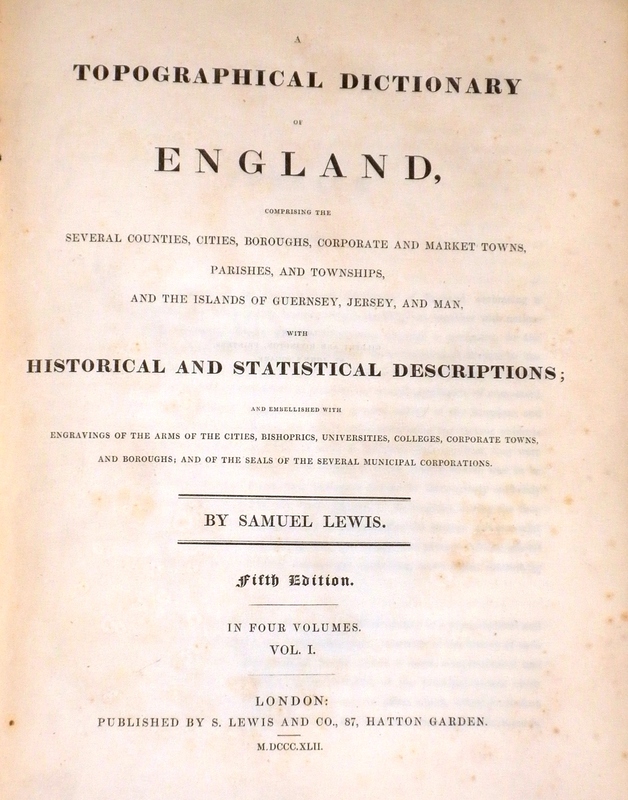 Published Sources: Samuel Lewis, A Topographical Dictionary of England, 1st edn, 4 vols (London, 1831); Samuel Lewis, A Topographical Dictionary of England, 5th edn, 4 vols (London, 1842); Laurence Worms, ‘Lewis, Samuel (1782/3–1865)’, Oxford Dictionary of National Biography, Oxford University Press, 2004; Birmingham Journal, 25 Jul 1836; The Times, 22 Feb 1838; Cork Examiner, 12 Aug 1844; Lloyd’s Weekly Newspaper, 22 Nov 1846; Caledonian Mercury, 29 May 1848. Unpublished Sources: National Archives: Census 1841, 1851, 1861; Principal Probate Registry: National Probate Calendar 1865; Parish Registers of St James, Clerkenwell; St George the Martyr, Southwark; St Stephen, Coleman Street, London (London Metropolitan Archives/Ancestry.co.uk). Lloyd’s Weekly Newspaper, 22 Nov 1846. The adjective ‘great’ is not one frequently applied to genealogists, but a notable exception is Sir William Betham (1779–1853), often described as a ‘great Irish genealogist’. Sir William was not however Irish by birth, and probably would not have described himself as a genealogist: his entry in the Oxford Dictionary of National Biography defines him as an antiquary and his abiding interest was in ancient Irish history. Sir William inherited his antiquarian interests from his father, William Betham senior (1749–1839), a clergyman and schoolmaster from Westmorland. After his marriage in 1775 to Mary Planque, a widow of Suffolk, Betham settled in that county and had fifteen children. He served as headmaster at Stonham Aspal, Suffolk, for nearly half a century; by 1829, by which time he was 80 years old, the church commissioners declared that the school had declined from its earlier ‘considerable repute’. Betham nevertheless remained in post until 1833 when he became Rector of Stoke Lacy in Herefordshire. It is hardly necessary to observe, that Genealogy is so intimately connected with Historical Knowledge, that it is impossible to arrive at any proficiency in the one, without being minutely versed in the other. 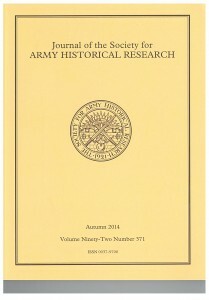 True to this observation, Betham senior was also a local historian; like many such projects, his intended county history never came to full fruition, but a single volume of a History of Suffolk was published in 1814, based on his findings, and his papers now form part of the Fitch collection in the Suffolk Record Office. 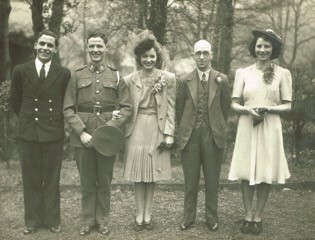 William Betham junior’s education was presumably provided by his father; neither appears to have attended university. His connection with Ireland was accidental; as a young man in 1805, he visited the Record Tower at Dublin Castle (then the repository of state records) to search for some documents for a law case on which he was employed. The disarray in which these records were kept so struck him that he asked to be appointed deputy keeper of the records. This application was successful, and Betham moved to Dublin and set about restoring order to archival chaos, becoming also deputy Ulster King of Arms. 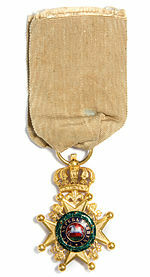 A knighthood followed in 1812 and eventually, in 1820, Sir William Betham was appointed Ulster King of Arms, a post he held until his death (he was succeeded by another publisher-antiquarian, Sir John Bernard Burke). Betham was not to know of the still greater ‘irreparable losses’ which were to come, when the Public Record Office was set alight in 1922 and so many documents – wills, parish registers and early census returns – were lost for ever. He was thus unaware that the greatest of his legacies to the historian and genealogist would be, not his published works, but his private notebooks, for while supervising the indexing of the Prerogative Wills in his keeping, he had made genealogical abstracts of them (up to 1800 for wills, up to 1802 for administrations), from which he created sketch pedigrees which contain later additions and amendments. The notebooks ran to 34 folio volumes and were accompanied by a meticulous ‘index of alliances and aliases’. These abstracts, known as Betham’s Abstracts, are now in the National Archives, Dublin and go some way to mitigating the enormous loss of the original wills and administrations. Betham died in his adopted city of Dublin in 1853 and was buried at Monkstown, County Dublin. J. T. Gilbert, ‘Betham, Sir William (1779–1853)’, rev. Michael Erben, Oxford Dictionary of National Biography, Oxford University Press, 2004; online edn, Jan 2008. J. T. Gilbert, ‘Betham, William (1749–1839)’, rev. Colin Lee, Oxford Dictionary of National Biography, Oxford University Press, 2004; online edn, Oct 2005. Sir Arthur Vicars, Index to the Prerogative Wills of Ireland, 1536–1810 (Dublin, 1897). The Prerogative Court dealt with estates in more than one diocese; before 1816 its records were fragmented since hearings were usually in the judge’s residence. 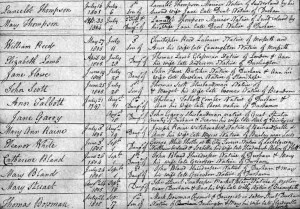 We have previously hailed Thomas Cromwell, father of the English parish register, and the 18th century priest and antiquary, William Dade (1741-1790), who strove to make the register a more detailed genealogical record. Contemporary with Dade, and more widely known, was a fellow priest of a very different order, Bishop Shute Barrington of Durham. Shute Barrington was born in 1734, son of John Shute Barrington (1678–1734), barrister, MP and ardent Protestant, educated at the University of Utrecht and a friend of John Locke. He was instrumental in reconciling the Scottish Presbyterian church to the union of Scotland and England: Jonathan Swift wrote in 1708 that he was ‘reckoned the shrewdest head in England’. He was elevated to the peerage in 1720 as Baron Barrington of Newcastle, Co Limerick, and Viscount Barrington of Ardglass, Co Down. Lord Barrington was born a Shute, but changed the family surname to Barrington when he inherited an estate in Essex from the husband of a cousin. His wife was Anne Daines, whose father, Sir William Daines, was MP for Bristol and a prominent local Whig. Shute Barrington was thus born into the Whig intelligentsia as well as the aristocracy; but he was the sixth of six sons (and three daughters). He was six months old when his father was flung from a carriage and died and so his eldest brother, William Wildman Barrington, 2nd Viscount, assumed a parental role. Educated at Eton and Merton College, Oxford, he followed the traditional path of younger sons and was ordained in 1756. He gained the favour of George III and became his chaplain soon after ordination and thence began a rapid climb up the ecclesiastical career ladder, becoming Bishop of Llandaff at the age of 35. A man known for his sincere piety, Barrington was no passive acceptor of the privilege and wealth that fell in his path. He caused a stir in 1772 in the debate surrounding the 39 Articles in which he went against his father’s principles and opposed the abolitionists. After losing his first wife in childbirth at a young age, he followed the inclinations of his second wife, the heiress Jane Guise, by standing down from a lucrative post at St Paul’s because Jane disliked living in the residence there. After becoming Bishop of Salisbury in 1782, he was renowned for his generosity and concern to be ‘the general friend of all’, while retaining friends in the highest places: the story goes that ‘gentleman from Berkshire’ inspected the Bishop’s ambitious restoration works at the Cathedral, paid for by public subscription, and added a contribution of £1,000 to the fund – the anonymous gentleman being George III. Barrington was an important patron of William Wilberforce and supported the abolition of slavery. In 1791 Barrington became Prince Bishop of Durham and here he continued energetically in charitable and educational projects, supported by his wife, who once presented every villager in a Durham village with a hive of bees. He was an influential church reformer, with fingers in many ecclesiastical pies, across a wide political and theological spectrum, from the evangelicals to the Catholic French exiles who settled near Durham during the French Revolution. Bishop Shute Barrington lived into his nineties, finally suffering a fatal stroke in 1826. Wilberforce had described him in his prime as ‘a very sun, the centre of an entire system’. That system has long since fallen away; what remains, for those of us who care, is the legacy of those meticulous and generous records of the very humblest members of his flock. Principal Source: E. A. Varley, ‘Barrington, Shute (1734–1826)’, Oxford Dictionary of National Biography, Oxford University Press, 2004; online edn, Oct 2009. Swift, Works, 1824, 15.318, cited in Arthur H. Grant, ‘Barrington, John Shute, first Viscount Barrington (1678–1734)’, rev. Philip Carter,Oxford Dictionary of National Biography, Oxford University Press, 2004. In a previous blog (July 2013) we lauded Thomas Cromwell, the formidable father of the English parish register. We turn now to a lesser known pioneer, the 18th century priest and antiquary, William Dade. Before Rose’s Act of 1812, there was no standardised form in which parish records were to be kept. Pre-1813 registers manifest a wide variety of skills and enthusiasm in record-keeping, from the barely literate to the garrulous. 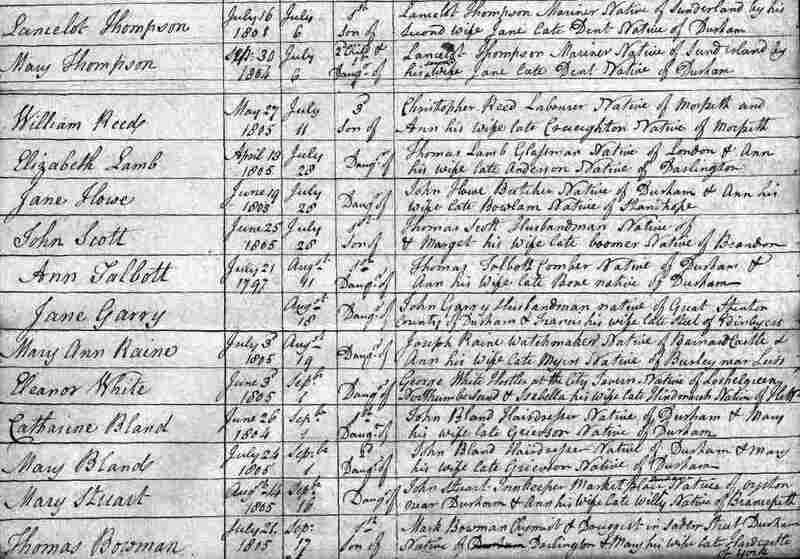 Anyone who works in 18th century Yorkshire records will at some point come upon a ‘Dade Register’, in which an unexpected wealth of genealogical information is embedded in a single record. William Dade, whose own baptism was recorded in the registers of Burton Agnes in the East Riding of Yorkshire, on 26 January 1741, came from a clerical family. 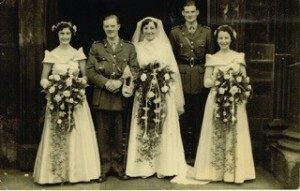 His father was vicar of Burton Agnes; his grandfather had also been a priest. Dade was a student at St John’s College, Cambridge, from 1759 to 1762, although there is no record of him having obtained a degree. From university he went into the priesthood, serving as curate in a series of York churches before securing his own parish of St Olave, Marygate, York, in 1771. Like many eighteenth century clerics he was a pluralist, being also the incumbent of St Mary, Castlegate, and St Michael, Spurriergate; and by the end of the decade he had also acquired the livings of Barmston and Ulrome in Holderness (East Riding of Yorkshire). Dade’s close involvement with parish registers made him see their potential as a precious source of historical data. He instituted a form of record-keeping in his parishes which asked for additional information to be added to register entries for the benefit of ‘the researches of posterity’. Each record of baptism, for example, was to include not only the father’s profession and ‘abode’ but also those of the father’s parents; the entry was also to state where the infant was placed in the family (whether first or second son, etc). Burial entries were to include the cause of death, the age of the deceased, and family details which made them superior to the Victorian death certificate that was to be introduced in 1837. Dade’s scheme was approved by Archbishop William Markham and introduced in the whole diocese from 1777. However, the concept of obedient and copious form-filling had yet to be imprinted in the national psyche. The extra work that it generated meant that it was short-lived and not all incumbents complied; those in densely-populated industrial parishes found it particularly arduous. It was discontinued after 1812 when the new standardised parish register books came in. Dade made Barmston his home and there embarked upon a history of Holderness which, like many a similar project, was never published, although it reached proof stage in 1784 and some fragments survive in the British Library. The author’s health had already begun to deteriorate and he died in 1790 at the age of 50. 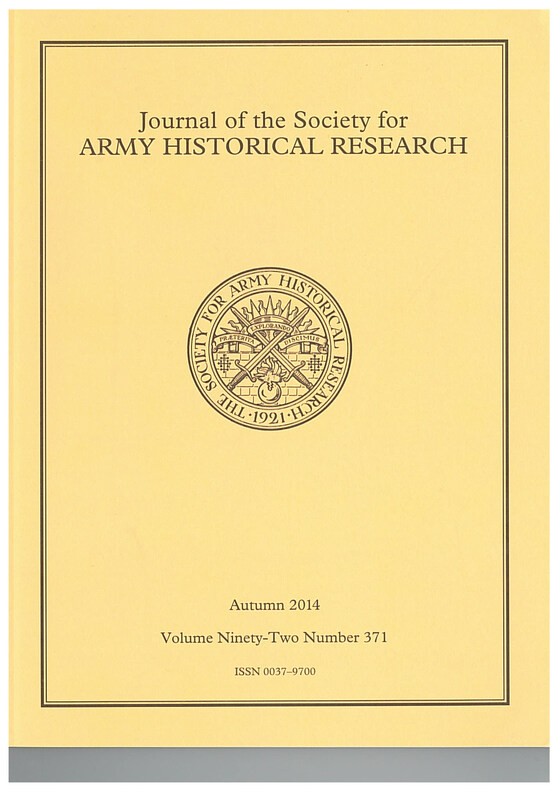 An informative discussion of Dade registers by Roger Bellingham, published in 2004 in Local Population Studies, emphasises the value of these records, not only for genealogists but for those with wider interests whom we might describe as local or social historians, or demographers: to William Dade, without a doubt, they would be antiquaries. William Joseph Sheils, ‘Dade, William (bap. 1741, d. 1790)’, Oxford Dictionary of National Biography, Oxford University Press, 2004 . Putting flesh on the bones of history – and of our genealogies – is something of a modern quest: in former times most ancestor-seekers were more concerned with clocking up generations, and if you could collect the odd title or historical celebrity along the way, so much the better. Today the celebrities are at the other end of the telescope: the enormously successful BBC series Who do you think you are? shines the sparkling light of modern celebrity into dry and dusty corners; who would have thought that archivists would make prime-time television? But now we no longer think just of extending that family tree as far back as possible: we want to understand more of the lives of our ancestors, however humble, and empathise with them. Novels – not historical novels but those written in a different age– can significantly increase our understanding of our own historic families. The men, women and children whose names we squint at on our computer screens all had their story. The census return permits us to peer at a household through the window; the novelist opens the door and lets us in. That is not to say that the novelist’s view is unbiased: reality must be bent to the writer’s will. Some will create monsters, caricatures, or lofty heroes and heroines who could never have survived a day in the real world; but there are others who paint the humdrum with painstaking skill and make it fascinating. had not merely lost all the qualities she had had as a child, but had gained none from age and experience to take their place. With no need to earn a living, in her latter years Henrietta drifts joylessly around Europe before dying at 63, ‘quietly and dully’, not quite deserted by her family but not much valued by them either. So convincing is the portrayal that at the end of the novel one almost reaches for the census indexes to look her up – and of course she is there, under a thousand different names. F M Mayor is a vocal narrator, often comparing her Victorian subjects with her own modern world of 1913. Henrietta Symons is not a self-portrait, although the author lost her fiancé to typhoid in 1903 and never married. Her own life was devoid of all glamour (she had tried unsuccessfully to be an actress when young) and her skills were not recognised during her lifetime. Nevertheless, like today’s celebrities, she shines her strong light upon the past, not only on the generation of which she writes but on her own times, and for this we must thank her. 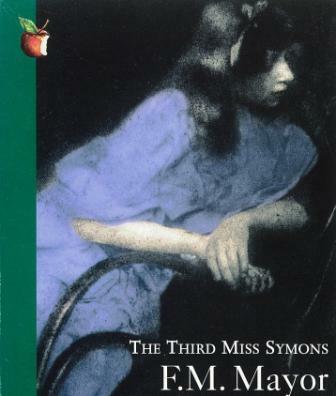 F M Mayor, The Third Miss Symons (1913: reprinted, Virago Press, 1980). Posted in: Genealogy, Uncategorized / Tagged: F M Mayor, The Rector's Daughter, The Third Miss Symons, Victorian spinster, Who Do You Think You Are?